It takes longer than I expect to get myself put together. This is probably a function of the weather and excitement - everything seems to be moving so quickly but somehow putting my gaiters on takes forever. Mareme, Godlisten, and Chris are all ready to go so I'm the last one bumbling around camp. As we leave, Godlisten tells Mchami to sleep in our tent to make sure no enterprising individuals take advantage of our absence. In my hustle to be ready to go, I neglect to put on some of my outermost laters (everything listed "IN PACK" above) because I don't want to delay the group any longer. And while we're still close to Barafu Camp, it's not much of an issue. Sure, it's windy and cold but the clothes I have on already are keeping me warm enough. 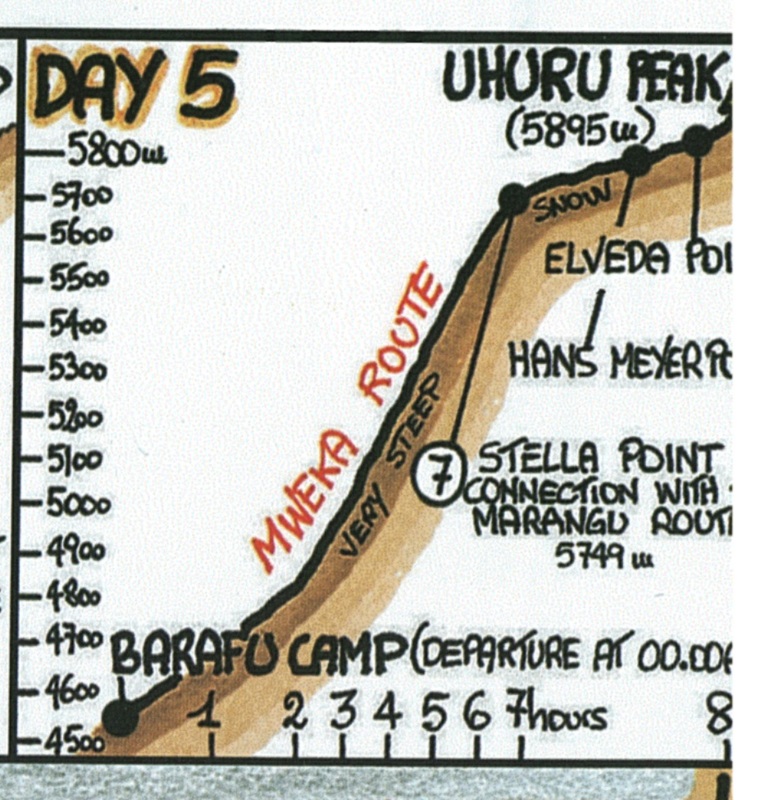 Excerpt from our souvenir map, showing profile of the hike from Barafu to Uhuru. As we depart camp, we see several groups of headlamps already well on their way to the summit. It's a clear night, but we are only one day removed from the new moon so artificial illumination is all we've got to guide us. Godlisten sets a pace on the firmer side of polepole and I love it - I'm staying perfectly warm and we are catching up to a few of the closer teams. The stars are bright and lovely, but it's hard to appreciate them when the trail is so steep and rocky. I remember to blow back my CamelBak hose but the bite valve is already starting to get crunchy with ice. We pause for a pee-break and I take some time to dig the chemical hand warmers out of my pack and pass them around; I brought extras for Godlisten and Mareme too. They both look so unfamiliar with their cold weather gear on. It's actually a little disconcerting for me to see them all bundled up and drives home the seriousness of summit night. Even though Kilimanjaro is often dismissed as an "easy hike" by seasoned mountaineers, the elevation is real and suddenly I realize that Godlisten and Mareme are take a big risk every time the agree to take strangers on this journey. It's something I'm not sure I would do myself. Perhaps with more high-altitude experience I would be able to guide any-and-all-comers to the roof of Africa, but for now I'm putting my trust in their expertise. And hoping I can be strong like a buffalo all the way up to 19,341'. Excerpt from our souvenir map. See the squiggles from Barafu to Stella? It's really like that. 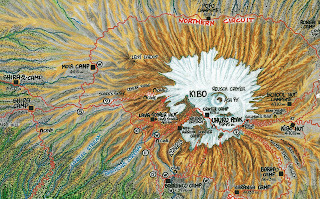 As we grind our way up to Uhuru Peak, the trail is steep, scree-filled, and switchbacky. I dig into my figurative AR bag of tricks and decide on "watch the boots in front of you" and "pay no attention to the clock time" as appropriate coping strategies. My breathing becomes labored and I launch into some impromptu Lamaze-type patterns. We continue to pass other teams until we are in the lead. I know it's not a race, but it is slightly gratifying to be in front of everyone. The wind shows no signs of calming down, and threatens to push us over at times. Every one of these difficulties just adds to the "epic adventure" in my mind and makes the ascent more fun. About 3am, Chris takes a fall on one of the switchbacks. Mareme and Godlisten quickly hover around him, and I sit on a nearby rock to try and thaw my CamelBak hose. Chris seems okay but needs to slow the pace down, so Godlisten takes his pack and we continue in a more polepole manner. I dig out a now-frozen Honey Stinger protein bar (Dark Chocolate Almond Coconut, my favorite) and gnaw off pieces as we continue upwards. I am starting to get a little chilly, despite already putting on my big mittens and softshell jacket at a previous stop. The process of chewing/thawing the Honey Stinger bar is time-consuming, but it's also a nice distraction from the increasingly monotonous slope and wind. I have also given up drinking, despite an increasing headache. My water is either frozen or being carried in Mareme's pack (he took a bottle earlier when I was struggling to put it back in my pack's side pouch), and I don't want to stop the group to access what is most likely a bottle of ice anyway. Some time later (I am guessing about 4am), Godlisten tells us to "look over there". He points at a big green sign, and as we get closer we shine our headlamps on it to reveal the words "Stella Point". Stella Point, at 5739m, is a welcome landmark for any trekker, as it marks the end of steep hiking and the start of a gradual, easy walk to the Uhuru Peak (5895m). As if anything could be easy at 18,800 feet. Based on his gait, I am guessing Chris is in the "this is not easy" camp. He is swaying slightly with each step and it looks more like 4am on a college campus instead of 4am on a mountain. We unspokenly form a triangle around him (Godlisten in front, me and Mareme on either side) and in that formation our group walks the last few hundred meters up the mountain. It is still pitch-black, and while I can see some snow on either side of the path and lights from Moshitown below, I can't see anything else beyond my headlamp's beam. For all I know, the glaciers may have melted overnight. The wind is still threatening to knock us down at the first misstep. The path is wide and gravelly, except for a few spots where we have to skirt around large boulders. I trudge along, trying to ignore both my growing headache and my growing realization that we will be reaching the peak in darkness. And then, just as nonchalantly as we arrived at Stella Point, we arrive at the summit. I think it's about 5.00a (later confirmed via my photo timestamps). Another big green sign emerges from the darkness to mark our arrival at 19,341' or 5985m. I tell myself to soak in the last few steps but it's all just so surreal. The crazy winds, the darkness, the lack of people, and then this sign in the middle of nowhere telling me I'm at the top of Mount Kilimanjaro. Honestly, it's a bit anticlimactic, because I can't see anything and for all I know that sign could be in the middle of the Katy Trail and I would believe it. But I choose to believe that we are indeed standing on the roof of Africa and so I dig out my camera to start documenting the event. We take some group pictures, and then I remember to dig out my Pfoodman Pflag for a triumphant shot. Except, the wind makes it impossible to hold the darn thing straight, so I settle for a "oodm Raci" photo and pack everything up. Despite my headache I am trying to linger at the summit, hoping to catch the first wisp of sunrise, but Chris is making it very clear that he needs to descend. Godlisten and Mareme are eager to get out of the cold as well, so just as quickly as we arrived, we leave. The Pfoodman Pflag at the summit of Kilimanjaro. On the way back to Stella Point, we encounter another team on their way up. They all look strong and we exchange high fives. Another group of people is at Stella Point, and they take a couple photos for me after I change my camera battery (not an easy task in the conditions). We continue to see groups of people ascending as we may our way down the mountain. 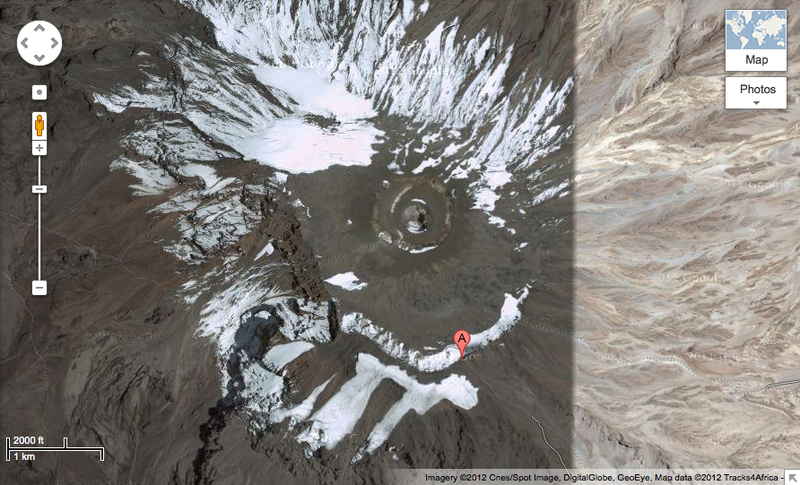 Some look strong, and I am envious that they will have sunlight on the summit. Some groups look so spaced out that I wonder if they will enjoy it. But we have accomplished what we came to Africa to do, and we are all safe, so down we must go. Salute to the STL mtb community! Just as the sunlight is starting to peek over the horizon, Godlisten tells Mareme to take the lead down a scree field. We leave the established trail and start making our own way down the gravelly slope. It's soon apparent that the fastest and easiest way down the field is a modified run/ski, which I embrace and start losing elevation at a very rapid rate. The dust is blowing everywhere because the wind is now at our backs. It's a crazy way to descend, but it's also really fun and just adds to "epic adventure". The scree continues on and on and so we ski on and on. My legs are getting tired but the skiing sure beats hiking downhill! After an hour of skiing, Chris gets concerned that we aren't on a recognized trail and asks for a break to get his bearings. It's now light enough to turn off our headlamps. Mareme reassures him that we are running parallel to the official trail and we will be able to see camp in a few minutes. 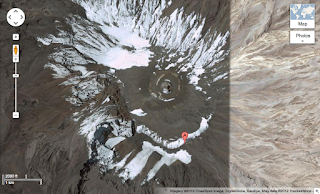 And he is right, a few minutes later we can see Barafu Camp, but we sure have a ways to go to get to Barafu Camp. By now my legs (mostly my shins) are very fatigued and all I want is to stop going downhill. But of course that's the only thing offered by this trail so we continue to descend. We are back on a trail now, but it's not the one we used to climb up so it's hard to gauge how much further we have to go. Sunrise on the scree field, with a view of Mawenzi. Finally, finally, we arrive back in Barafu Camp. Just as we were the first tourists on the summit, we are the first tourists back in camp and our crew is a little surprised that we've arrived so early (it's about 7.00a). Godlisten has to wake most of them up, but they all come over and congratulate us on a successful summit. Then, we're instructed to go nap in our tent. Mchami brings over a bottle of pineapple juice and I find some shortbread cookies left over from that morning. Those two items paired with a packet of Justin's Maple Almond Butter make a perfect post-summit snack. I consume it all and then go straight to sleep. Exhausted!